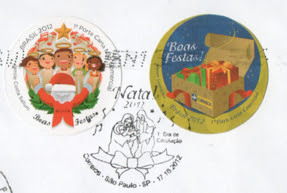 Last week I received this amazing letter from João in Brazil, which was a great delight. 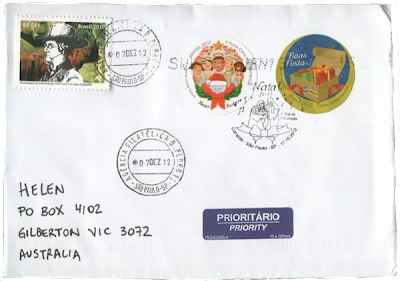 João contacted me after I put up a post about Australia's Christmas stamps and asked whether I would like to do a stamp swap, as he collects Christmas themed stamps. How wonderful! 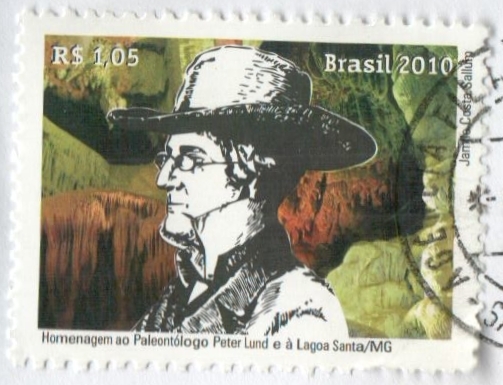 A stamp featuring a palaeontologist. João totally has me pegged. I really love the stamp design as well - the black and white portrait sketch against the intriguing background of a cave full of fossils. Awesome. Great stamp. Books forming the architecture of the library. Fantastic. I know I am often a little too liberal with my superlatives, but this stamp is pretty darn magnificent. 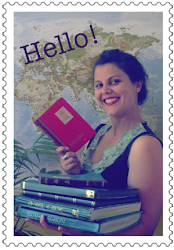 To be honest, I don't know which stamp I love more: the bibliotheque or the palaeontologist. A very hard call. But I am thrilled to now have them both in my collection. João also threw in one more little surprise, a strip of stamps featuring female aviators. It was the aviators that really caught my attention. I shall now have to find out who they were and when they flew. I like the library stamp and the aviation ones very much. How lovely to have all those surprises in the mail. I recall you wrote that the Aus Christmas stamps were not pretty this year? What a lovely letter to receive! Thank you for sharing this bounty with us today. Helen, I'm glad you enjoyed it. I'll try to get the FDC's Peter Lund for you. On my blog has a post about the pioneering women in aviation. Wow.Some people are so generous! I love that library stamp best, but the strip of aviators is also nice. Love the library stamp Helen. How nice to receive that in the mail. Those stamps are all nice, but my favorite is the librafy stamp. what a great postal item(s) to get in a mail! What a wonderful stamps arriving in the post. I like the palaeontologist, it reminds me of those Victorian figures they used to use in miniature theatres. The starry sky in the aviators is a nice touch, and as an ex-Librarian I'm always attracted to a row of books.